Another week and another great example of how culture is creating strong community links through the work of Find Your Talent Leeds. Year 2 children from Asquith Primary School in Morley are exploring the past through a heritage project led by Creative Facilitator, Irene Lofthouse. Children and their teachers are bringing to life the history of the markets town’s key buildings and landmarks. The work will form the basis of a child and family friendly Morley heritage trail connecting the experiences of different generations. This project reflects a key strand to Find Your Talent Leeds ethos; linking together different partners to engage all children and families in their cultural heritage and connect communities. Irene has worked with Find Your Talent , Artemis (Education Leeds), Leeds Libraries; Leeds Museums and Galleries; Morley Archives and Morley Local History Group to create an inspirational learning experience for children. 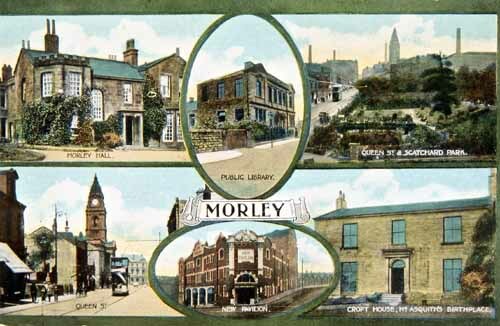 It draws on some of the exciting resources Leeds has to offer to make the history of Morley relevant to children who live there now. Find Your Talent was a national programme to explore new ways of opening up cultural and creative opportunities to young people. Leeds was one of the ten FYT Pathfinders in England. The programme was led by Leeds City Council and Education Leeds, working closely together and with the city's cultural and community sectors to find ways for more young people to participate in the cultural life of the city. FYT was funded to operate between 2008-2011 but its legacy in Leeds continues through activities under the Breeze banner, as well as other initiatives.